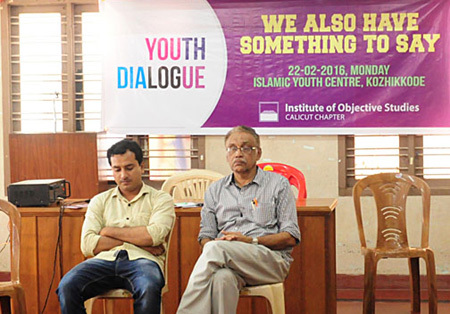 Calicut: IOS Calicut chapter of the Institute of Objective Studies conducted a youth dialogue with the theme ‘WE ALSO HAVE SOMETHING TO SAY’ on 20th February 2016 at Islamic Youth Centre auditorium, Kozhikode. Around 30 youths, both men and women, attended the programme to air their views, anxieties and hopes about Indian Muslims as well as Muslims in other parts of the world. The participants were drawn from various fields. There were students, journalists, research scholars, leaders of different youth and student organisations, teachers, e-activists, etc. The dialogue started with an introduction of A A Vahab, secretary IOS, Calicut Chapter. He quoted extensively from the Quran, to underline the importance of youth in Islam and told the gathering about crucial role they had to play in future in helping the community to overcome its hurdles. Prof. P Koya, coordinator of the chapter, said that Indian Muslims had to take benefit of the democratic advantage to lead not only themselves, but the nation. According to the Census Report of 2011, 47% of Muslim population in India were young and in their most productive age. He also said that it was the first of such dialogues in the state. C. Dawood, executive editor of Media One TV, and Rafeeq Kuttikkattoor, the vice principal of Green Valley Academy, Manjery, were members of the presidium which moderated the discussion. IOS insisted that the delegates were free to share their views. V M Fahad proposed a vote of thanks.